For marketers, mobile push notifications are a valuable tool. As a direct channel to consumers, these mobile messages can help you raise brand awareness and improve customer engagement. Unfortunately, for consumer audiences, these same messages are more often than not a mobile menace. According to a recent study by marketing firm Hipcricket, more than half of consumers surveyed described mobile alerts from companies as intrusive, and even "spammy." That's not good news for anyone. 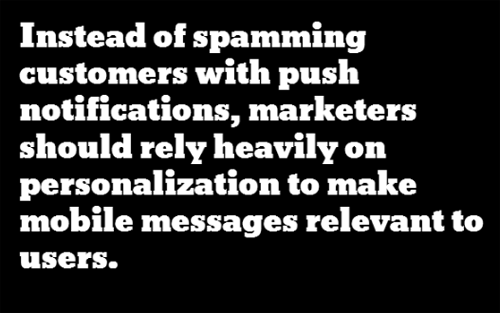 Consumer reaction to push notifications should serve as a serious warning to marketers. If you irritate customers with mobile spam, you risk alienating them from your brand both online and offline. Mobile devices in particular are highly personal accessories, which means intrusive communications can do even more damage than they might in other channels. As an example of how a negative experience can impact consumer behavior, consider one study conducted by Akamai. In a survey of consumers, the company reported that a third of respondents said they were less likely to spend money with a company after having a poor mobile app experience. Instead of spamming customers with push notifications, marketers should rely heavily on personalization to make mobile messages relevant to users. It's a common-sense strategy, but one that's been difficult to implement in the mobile app world until recently. Fortunately, new Mobile Experience Management (MEM) platforms make it easier to personalize both the app experience and any integrated push messaging initiatives. These technology platforms combine app publishing and the management of push notifications with deep analytics driven by consumer app usage. With the help of an MEM platform, there are an infinite number of ways to personalize mobile messages… and to avoid the appearance of spamming your customers. Here are five ways to use personalization to elevate your mobile messaging strategy. Location information is one of the greatest assets available in mobile marketing. With push notifications, you can use location data to trigger a personalized message that is relevant to a geographic region or even to a user's specific experience. For example, if you know that a consumer has traveled far from home, you can send an alert with helpful tips or recommended products that might be useful while on the road. This type of message can be queued up automatically by tying location information in an MEM platform to a pre-developed messaging campaign. Consumers interact with your brand across a number of platforms, and data from activity in other channels can be very useful for personalizing mobile messages. If a user has spent time on your website on a PC, for instance, you can use that information to craft a mobile message encouraging continued exploration on a smartphone or tablet. Behavioral data shouldn't be isolated in siloes. Make the most of analytics available across multiple channels to improve messaging personalization. Product and content recommendations based on past behavior are a staple in the website marketing world, but the same tactics can now be applied automatically within a mobile app as well. With an MEM platform, you can take what you've learned from past in-app activity to drive further activity in the future. Use personalized recommendations both in your app and in mobile alerts to nudge consumers toward a desired a goal. If someone is an active and loyal customer, you can use a carefully targeted push notification to offer a note of thanks. Don't overwhelm a user with a high volume of messages, but a timely thank-you, potentially with a relevant promotional offer attached, is often appreciated. Personalized deals show you value your customers, and can also offer a strong incentive for users to click through on a message and re-open your mobile app. Sometimes consumers start down a path of learning more about specific content or shopping for a product, but then get distracted and abandon the experience. With an MEM platform, you can re-engage with a consumer by sending an alert that links directly back to the point of app abandonment. That's more than a message saying "we miss you!" It's a useful tool for creating a personalized and seamless experience for users with a thousand other demands on their attention. When implemented well, push notifications are a great way to connect with consumers and extend brand engagement. The key is to use mobile messaging in a way that doesn't alienate your audience. Don't spam your customers. Offer them relevant information. The cure for spammy-ness is personalization. Bob Moul serves as CEO of Artisan Mobile. With more than 30 years of experience in the high-tech industry, Moul has held leadership positions within technology companies across all stages and sizes and was previously CEO of Boomi. Moul has spoken at numerous industry and educational events for his insights on technology trends and driving business growth.